Extremely rare original old Raj Kapoor Bollywood movie poster of the hit Hindi film, Jagte Raho (1956) for sale. This is an actual surviving original Yugoslavian publicity poster of the 1956 black and white Bollywood film produced by and starring the greatest entertainer of all time in Bollywood, Raj Kapoor (also known as The Show Man of Indian cinema). This extremely unique publicity poster was designed and printed in Yugoslavia for publicity of Jagte Raho exclusively in Yugoslavian theaters. The unique hand painted artwork seen in this old Bollywood movie poster was designed exclusively for the film’s promotion inside Yugoslavian theaters and was only used in Yugoslavia, making it truly one-of-a-kind and highly collectible. This old Raj Kapoor film poster was printed and circulated during the original first release of the film in Yugoslavia (late 1950s). This was the official promotional poster designed and printed for publicity of the film in Yugoslavian theaters in the late 1950s but never ended up being used. For a nation that witnessed relentless NATO bombing and conflicts, its an absolute miracle that this Yugoslavian Raj Kapoor movie poster has survived intact! In summary, featured here for sale is an almost impossible to find original Yugoslavian Raj Kapoor Bollywood movie poster! 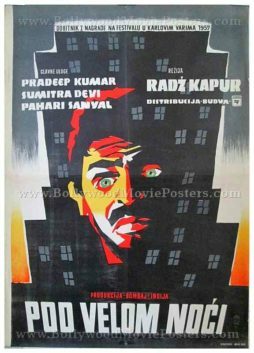 This old hand painted Bollywood film poster bears an extremely unique design that features a brilliant hand painted portrait of Raj Kapoor set inside a city building. The poster was originally designed on a hand painted canvas by a Yugoslavian poster artist. In the poster, the artist has tried to subtly capture the essence of the plot of the film – A poor villager (Raj Kapoor) finds himself struggling to survive the harsh and indifferent city life. Jagte Raho is a 1956 Bollywood film directed by Amit Maitra and Sombhu Mitra, produced by and starring Raj Kapoor. It was also produced in Bengali as Ek Din Raatre. Extremely rare original old Raj Kapoor film poster of the hit Bollywood movie Jagte Raho (1956) for sale. This is an actual surviving original East German publicity poster of the 1956 black and white Bollywood film produced by and starring the greatest entertainer of all time in Bollywood, Raj Kapoor (also known as The Show Man of Indian cinema). This extremely unique promotional mini-poster (roughly A4 size) was designed and printed in East Germany during the Cold War for publicity of Jagte Raho in East German theaters. 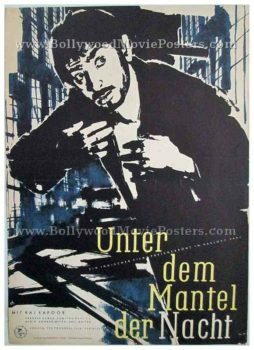 The unique hand painted artwork seen in this old Bollywood movie poster was designed exclusively for the film's promotion inside East German theaters and was only used in East Germany, making it truly one-of-a-kind and highly collectible. This old Raj Kapoor film poster was printed and circulated during the original first release of the film in East Germany during the Cold War (mid 1950s). This was the official promotional poster designed and printed for publicity of the film in East German theaters in the mid 1950s but never ended up being used. This old hand painted Bollywood film poster bears an extremely unique design that features a brilliant hand painted portrait of Raj Kapoor. In this poster, the artist has tried to capture Raj Kapoor from an iconic scene in the film. He is seen attempting to drink water from a tap, before being spotted by a security guard. The city skyline in the night is seen in the backdrop.